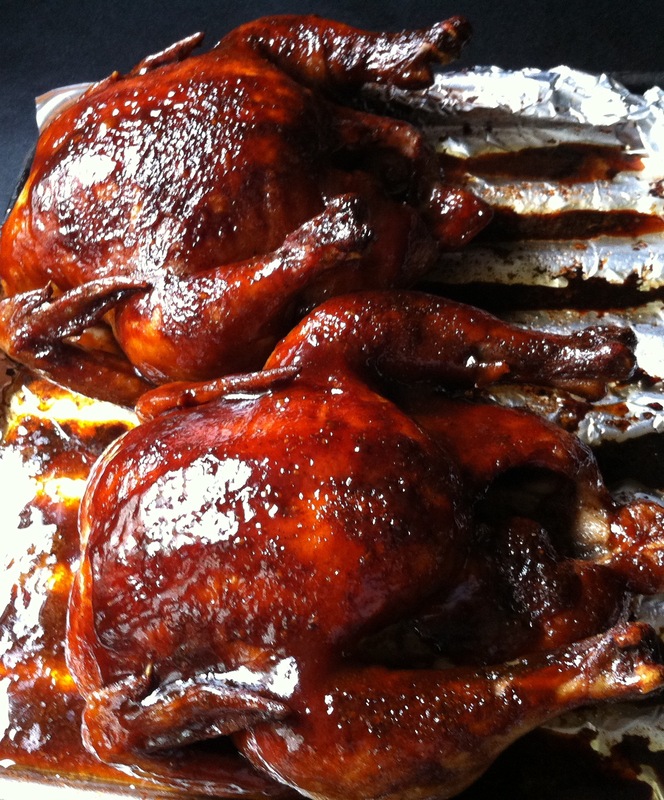 I really love the deep flavor of soy sauce and the sweetness of hoisin on poultry. Peking duck is the best example of this, but since I live in Rhode Island, I don’t get a chance to jump in the car and drive to Chinatown in Boston or New York at the drop of a hat. I had to come up with a plan B…and a good plan B! I found it while looking through an old Chinese cookbook I had bought many years ago. Written by legendary NY Times food critic Craig Claiborne and Virginia Lee, “The Chinese Cookbook” has become my bible for all of my Asian dishes. I use chicken instead of duck. It’s cheaper, easier to find, and I can easily buy a whole pasture-raised chicken from local farms here in Rhode Island. But it is just as delicious. As long as you use gluten-free soy sauce and hoisin sauce (La Choy and Kikkoman make them and they’re found in just about any supermarket), this recipe is gluten-free. Remove all the giblets from the chicken and discard. Rub the soy sauce first all over the chicken. (The chicken will absorb the flavors better if you do it before you rub the bird with the oil.) Then rub the peanut oil all over the chicken. Combine the Chinese five spice, garlic, salt and pepper in a bowl. Season the entire chicken, including inside the cavity, with this mixture. Pre-heat the oven to 325 degrees. Place the chicken in a pan lined with aluminum foil (cleanup will be easier) and bake. Meanwhile, combine the hoisin sauce and sesame oil in a small bowl. When the chicken is about 15 minutes away from being done, brush it with the hoisin/sesame oil mixture. Cook it another 15 minutes until the chicken has a nice dark glaze. Don’t let it burn! Let it rest about 15 minutes before carving. Sometimes the happiest of cooking accidents happen with bacon. My original plan was to make Chinese-style honey ribs for dinner. But instead of pulling a nice rack of ribs out of the freezer, I accidentally took out a slab of pork belly. I only realized my mistake when I thawed it and started cooking it, so I decided to continue the process with the pork belly instead. The results were pretty damn tasty. Mix the marinade ingredients. Set aside. 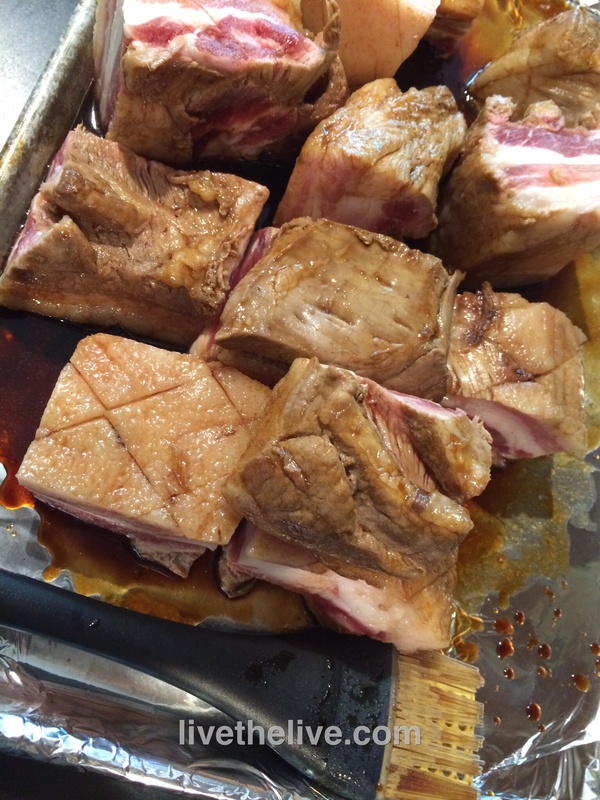 Cut the pork belly into pieces that are about 3 inches square. Place them in a large pot. Cover them with water and bring it to a boil. Boil for 5 minutes. Drain. 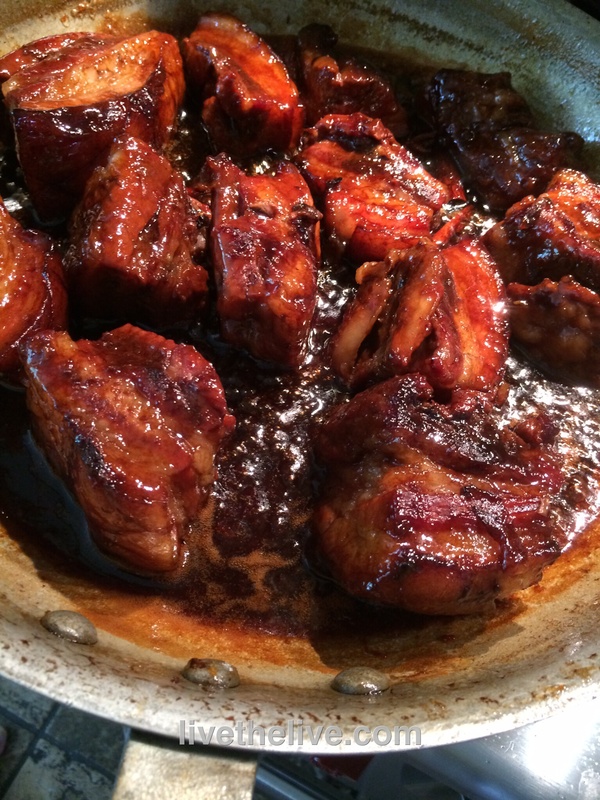 Place the pork belly pieces on a sheet pan lined with non-stick aluminum foil. Coat them with marinade while they’re still hot. Let them sit for 10 minutes. Pre-heat the oven to 350 degrees. Bake the pork belly pieces on the sheet pan for 30 minutes. While the pork belly is baking, start the sauce in a large non-stick pan or pot: combine the lemon zest and juice, star anise, cinnamon sticks, honey and chicken broth. Bring it all to a boil, then reduce to a simmer. When the pork belly pieces have finished baking, add them (and any fat or liquid in the pan) to the sauce pot and simmer (covered) for at least 15 minutes or until the meat is tender. Turn the heat on high, uncover the pot and cook until the sauce is reduced to a glaze that coats the ribs. Reduce the heat as the sauce thickens to avoid the sugars in the honey from burning. When the pieces are sticky and gooey, they are ready! 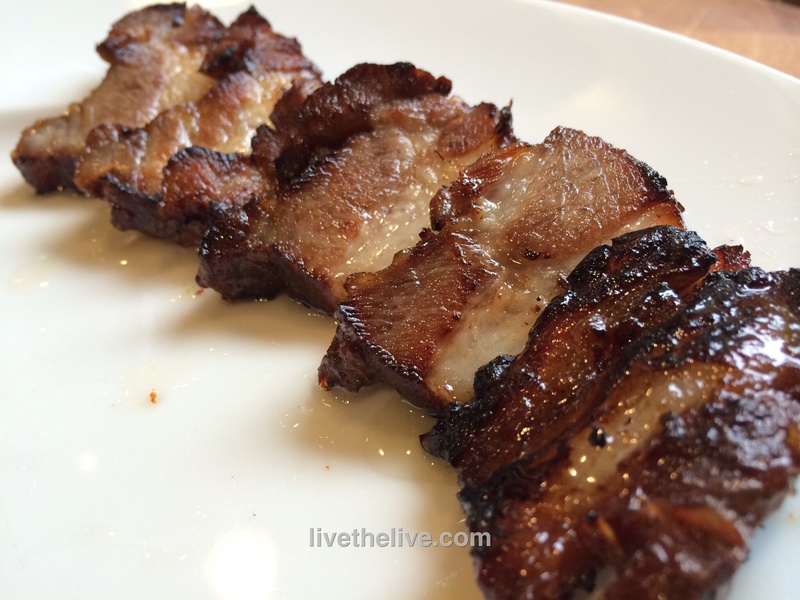 Let a piece of pork belly cool…then slice the to the desired thickness and fry it like regular bacon….or just pop it in your mouth like pork candy! There’s something about Asian noodle dishes that make them incredibly addictive. 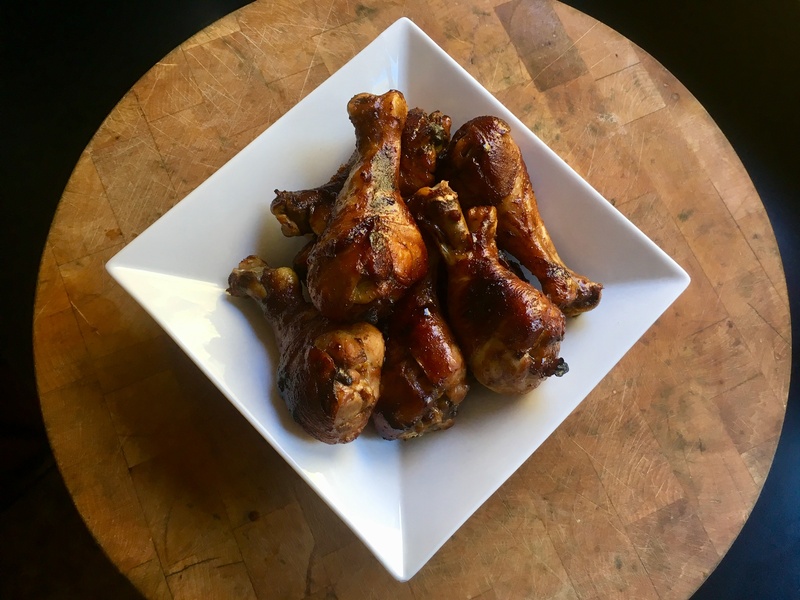 They’re great hot or cold, and easy to make at home, which is important to me because I live in the boonies, about 30 miles from my favorite Asian restaurant. I store an arsenal of basic Asian ingredients in my pantry, so slapping this together is no effort at all. 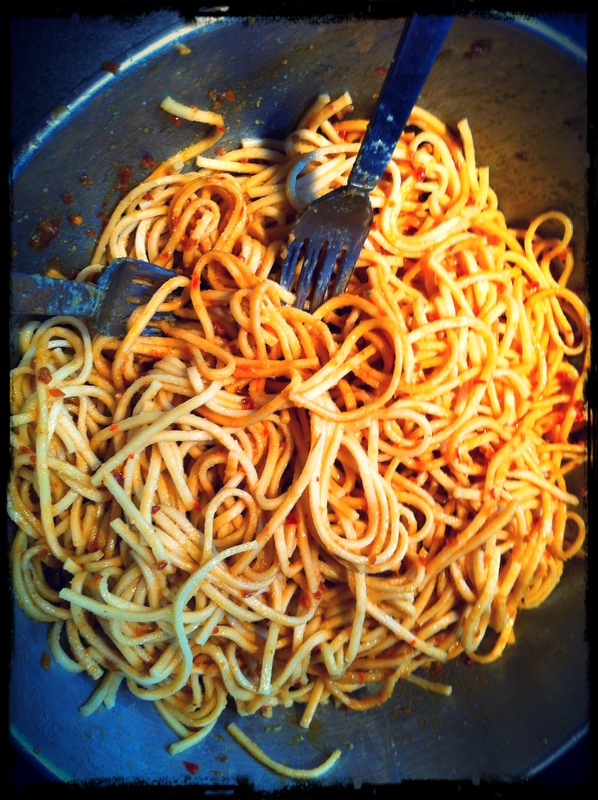 And if you don’t have Asian noodles around, chances are you’ve got a box of pasta, which works just as well. Next time you’ve got a bunch of people coming over to watch some football, cook a batch a few hours beforehand and let it come to room temperature. It’s great with anything, especially ribs. Grab a bag of frozen egg rolls or some potstickers, and you’ve got great munchies for the game. To make this recipe gluten-free, I use GF pasta…and you can find gluten-free hoisin sauce in the Asian food section of most supermarkets. 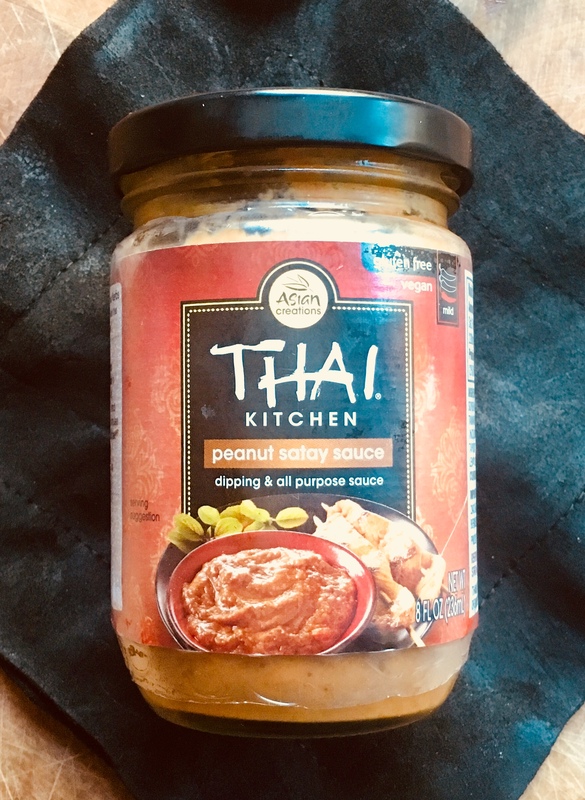 Combine the peanut butter, hoisin sauce, sesame oil, and chili garlic sauce in a bowl. Set it aside. I keep my peanut butter in the fridge once the jar is open, so sometimes it’s a bit thick. So I just zap it in the microwave for about 10 seconds to soften it up. Boil the noodles or pasta until al dente. Drain it and place it in a large bowl. Mix the noodles with the sauce. I recently hosted a “boys’ weekend” at Saule, our rental home in Little Compton, Rhode Island (http://www.sauleri.com. We’re listed at Homeaway.com), and when you’ve got guys coming over, you’ve got to have ribs! I like making these because they don’t require hours on the grill. They’re gooey, sweet and absolutely delicious! Mix the soy sauce and the hoisin in a bowl, and set aside. These are the marinade ingredients. 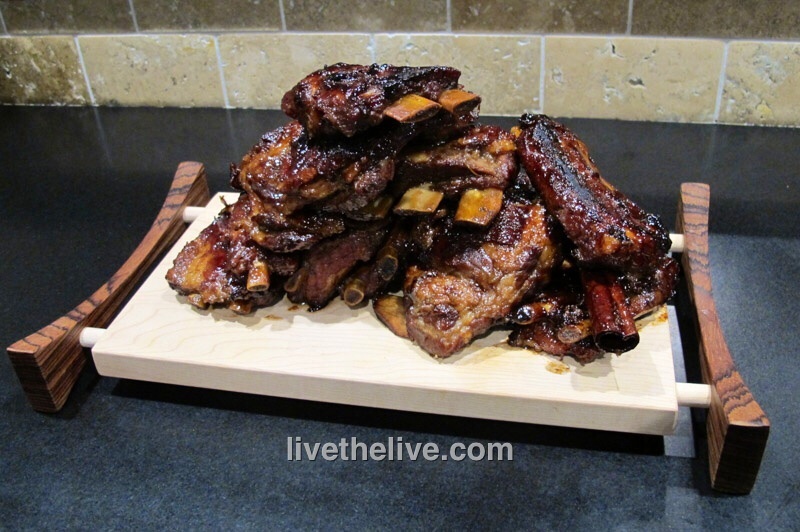 If the ribs are large, cut them into individual pieces. If smaller, cluster 2 or 3 ribs together. Place them in a large pot. Cover them with water and bring it to a boil. Boil for 5 minutes. Drain. Place the ribs on a baking sheet lined with non-stick aluminum foil or with a rack and coat them with the marinade. Let them sit for 10 minutes. Pre-heat the oven to 350 degrees. Bake the ribs on the baking sheet for 30 minutes. While the ribs are baking, start the sauce in a large non-stick pan or pot that will hold all the ribs: combine the lemon zest and juice, star anise, cinnamon sticks, honey and chicken broth. Bring it to a boil, then reduce it to a simmer. When the ribs have finished baking, add them to the sauce pot and simmer (covered) for at least 15 minutes or until the rib meat is tender. Turn the heat on high, uncover the pot and cook until the sauce is reduced to a glaze that coats the ribs. Be sure to reduce the heat as the sauce thickens or the sugars in the honey will burn! When the ribs are sticky and gooey, they’re ready. Substituting grapefruit for the lemon works really well, too! Shrimp with an orange sauce is something you see on every Chinese restaurant menu. I didn’t have oranges, but wanted a citrus kick to my sweet and spicy sauce. I went with grapefruit and I never looked back! 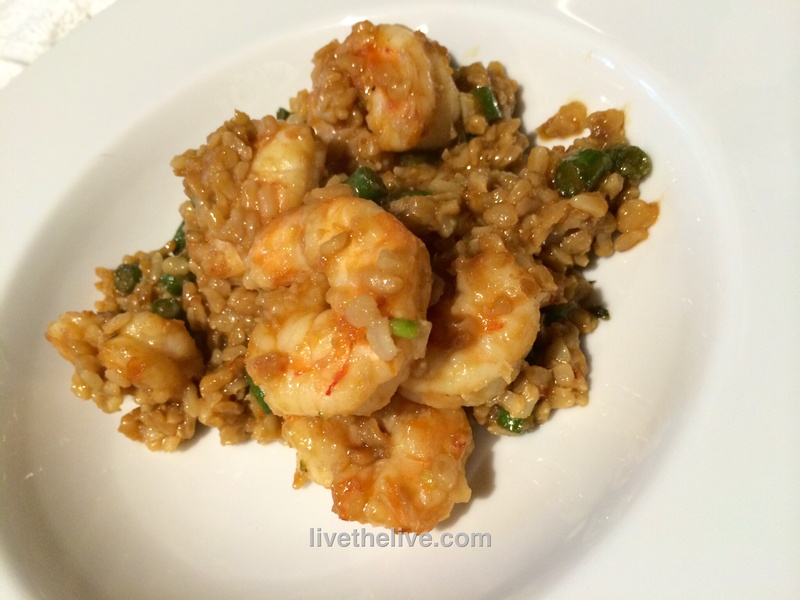 Although I call this recipe “Asian shrimp,” I never buy my shrimp from Asia! Only wild-caught American shrimp will ever do. When you realize just how nasty Asian shrimp can be (farmed in over-crowded conditions, swimming in their own filth and fed chemical food pellets) you’ll never eat it again. Green beans are now growing in my garden, so I used them, but feel free to substitute with broccoli, asparagus, or any other veggies you like. Chili garlic sauce and hoisin sauce can be found in most supermarkets, in the international foods section. As long as you use gluten-free soy sauce and hoisin sauce, this dish is gluten-free! Making your own seafood stock is easy: just peel the shrimp you’re going to use in this recipe, and place the shells in a saucepan full of water. Let it boil until you’ve reduced it to 2 cups. Strain out the shells and discard them. Then use the stock to cook your rice, according to the package directions. Once the rice is cooked, toss in the chopped scallions, mix well, and set the rice aside. Add peanut oil to a hot pan and saute the onions until translucent. Add the green beans and cook them until al dente. Add the soy sauce, stir, and then pour the contents of the pan into the rice. Mix well. Using the same pan, add a little more peanut oil and sear the shrimp on both sides. Don’t overcook them! Push the shrimp to the sides of the pan so that a circle remains in the middle. Add the chili garlic sauce and hoysin sauce and stir them together, then blending in the shrimp until the shrimp are covered with the sauce. Add the grapefruit zest and juice and stir until everything is combined and the sauce has thickened just a bit. Pour the contents of the pan into the rice mix and combine. Add more soy sauce to the rice, to taste. 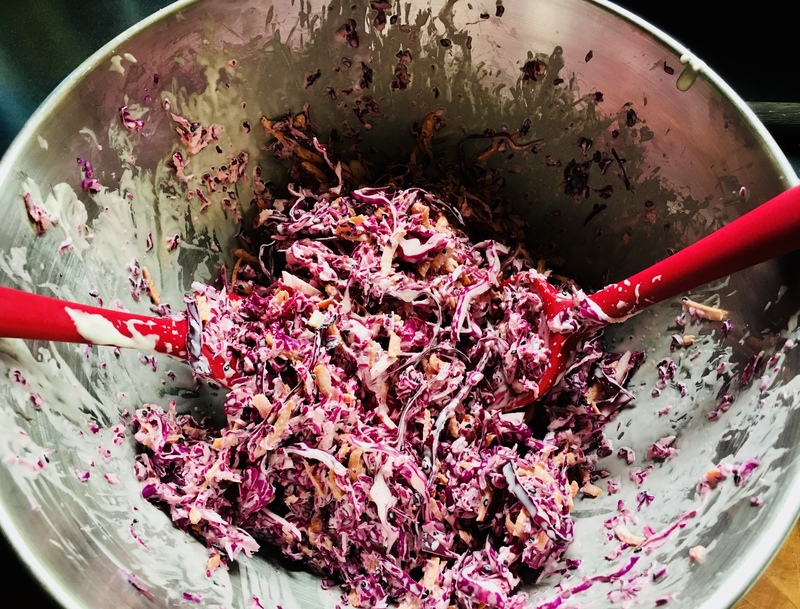 I love cole slaw. It’s awesome with any grilled food, but I especially love the classic pulled pork/cole slaw combo. Visiting the local farm stand the other day, the cooler weather crops were in, and there was a beautiful head of cabbage just sitting there, waiting for me to take it home. The farm stand had this beautiful purple cabbage, but use green if you like! 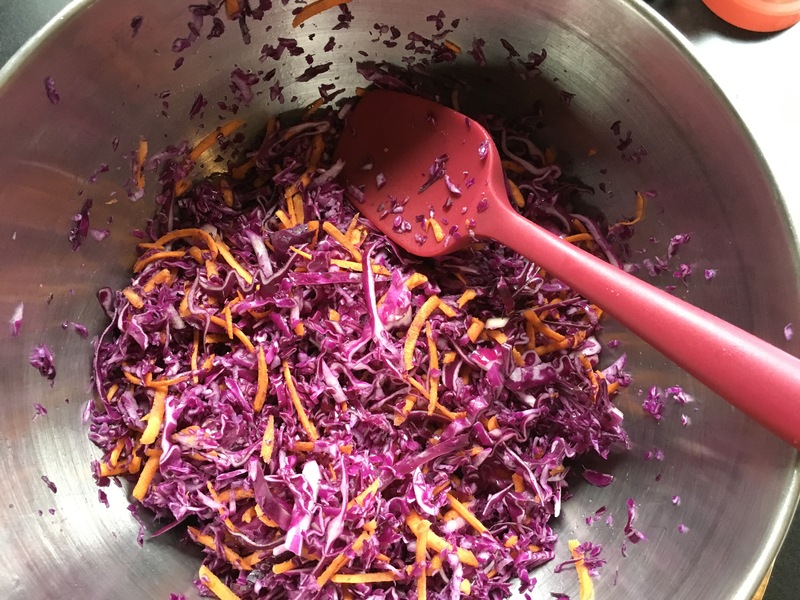 I wanted to try something different from the basic cole slaw recipe I usually make, and so I took my ingredients in an Asian direction. I think I came up with something that really rocks…and it goes great with a plate of Asian-inspired spare ribs! Shredded veggies, ready for the dressing. 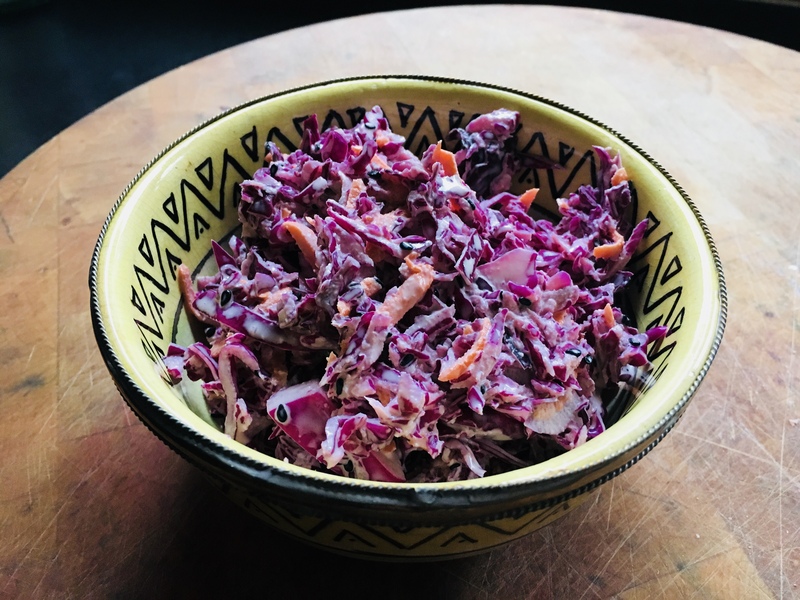 I like to give the cabbage different textures, so I wash and then quarter the cabbage, removing the center core (which is, by the way, totally edible and was given to me by my Mom as a treat when I was a kid. Hey, it’s a Lithuanian thing.) 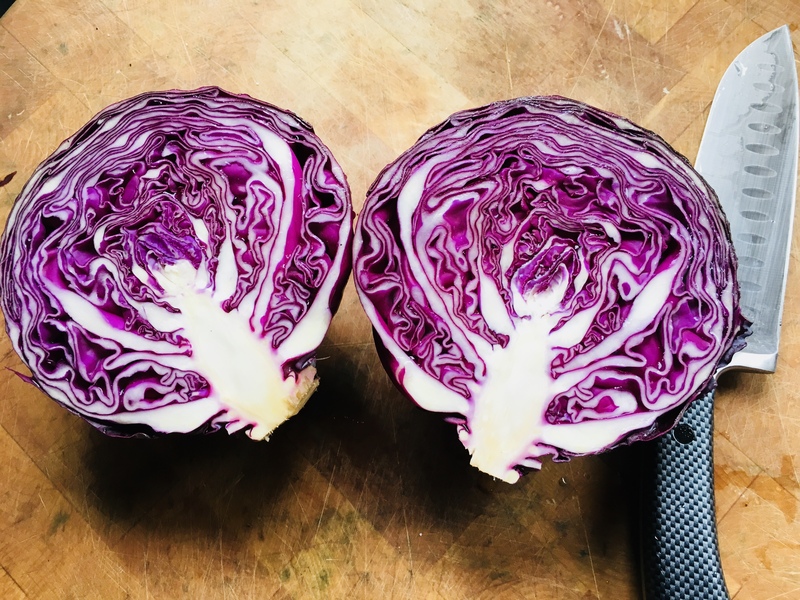 So I hand slice one-quarter of the cabbage as thinly as I can with a knife. The other three-quarters go in a food processor to slice more thinly. I put the carrot through the machine as well. I put the veggies in a large bowl and add the sesame seeds. 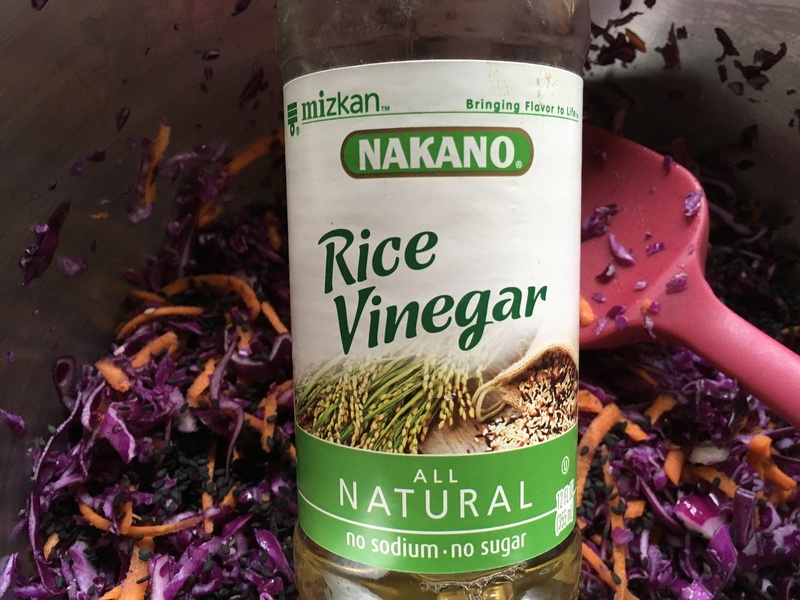 To make the dressing, in a separate bowl, combine the mayo, rice vinegar, sesame oil and honey, whisking to mix thoroughly. Rice vinegar is not rice wine vinegar. Make sure you use the good stuff. Here’s one brand I use. I’ve got many Asian ingredients in my fridge, so I started to put together a marinade and it tasted pretty good even before it went on the chicken. But afterwards, with the flavors baked into the drumsticks, it was amazing…and highly addictive! No matter how drumsticks you bake, it won’t be enough! 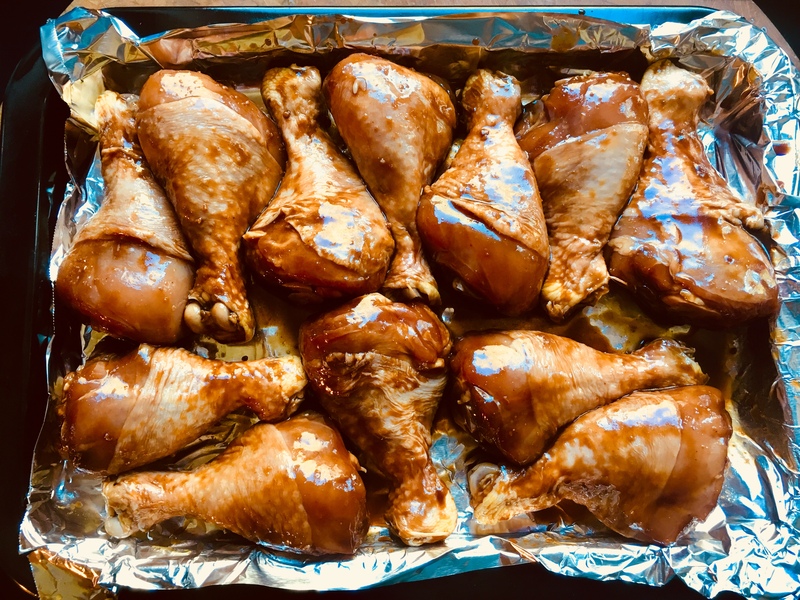 I tossed the drumsticks in a Ziplock bag, dumped the marinade on top of them, sealed the bag and squished it around a bit to make sure all the chicken got a hit of the marinade. I placed the bag in a bowl at room temperature (in case of spillage, it wouldn’t go all over my counter), and gently squished it around every half hour for about 2 hours. Combine everything but the chicken in a bowl and whisk well to mix. Place the drumsticks in a large Ziplock bag and pour the marinade in. Seal the bag well, and squish it around so that the marinade makes contact with every part of the chicken pieces. Let the bag sit at room temperature for 2 hours, squishing it around gently every half hour. Pre-heat an oven to 350 degrees. Line a pan with aluminum foil (to make clean-up easy later.) Lay the drumsticks in the pan, pouring the leftover marinade into a small saucepan. 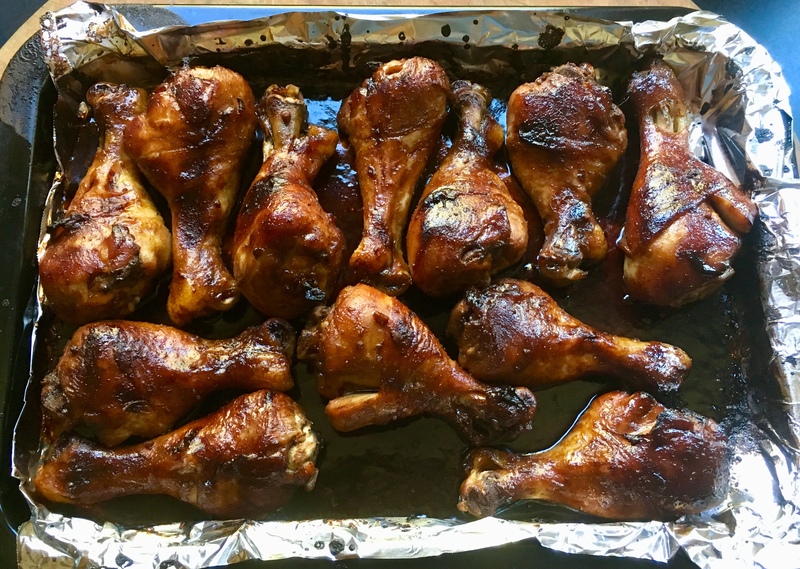 Bake the drumsticks for about 45 minutes. Take the pan out of the oven and carefully pour the juices in the pan into the same small saucepan with the leftover marinade. Keep the chicken “on hold” for a few minutes while you focus on the saucepan. Heat the saucepan with the marinade until boiling, then reduce the heat and cook a little more until the marinade has thickened a bit. Brush this all over the chicken pieces and return the chicken to the oven for the last 10 or so minutes of cooking. 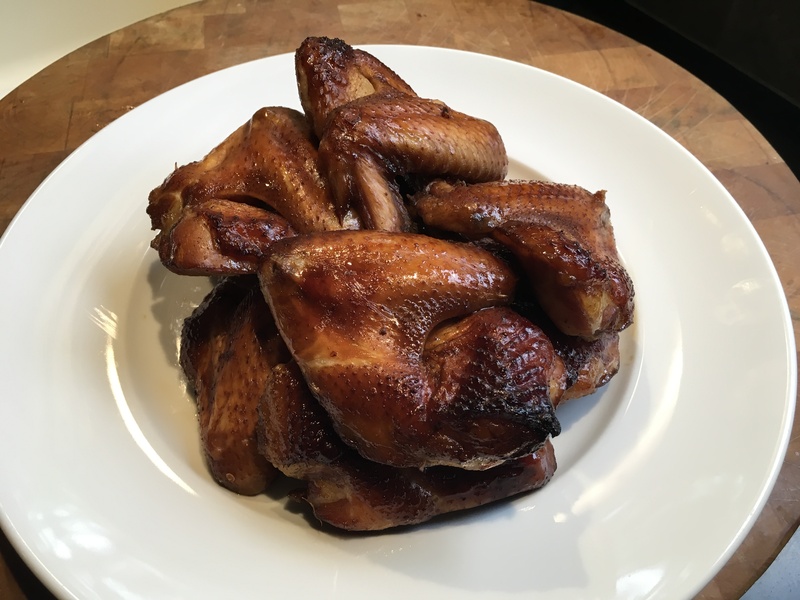 When I can’t get to Chinatown in Boston or New York, I cook my version of a recipe I discovered many years ago in “The Chinese Cookbook,” a wonderful source of information by former NY Times food critic Craig Claiborne and Virginia Lee. Whenever possible, I use a whole pasture-raised chicken. This recipe can be made gluten-free by using GF hoisin and soy sauce, available in most supermarkets. Remove all the giblets from chicken. Rub the soy sauce all over the chicken. Then rub the peanut oil all over the chicken. I get requests for this every year because it’s the easiest, tastiest way to make ribs indoors, and perfect for the big game. As the glaze cooks down, it gets sticky, gooey and delicious. While the ribs are baking, start the sauce in a large non-stick pan or pot: combine the lemon zest and juice, star anise, cinnamon sticks, honey and chicken broth. Bring it to a boil, then reduce it to a simmer. Turn the heat on high, uncover the pot and cook until the sauce is reduced to a glaze that coats the ribs. Be sure to reduce the heat as the sauce thickens or it will burn! When the ribs are sticky and gooey, they’re ready.